Kenneth Kades began his career in McDonald's as a crew person in Cleveland, Ohio back in 1964. In 1982, he became an Owner/Operator in Texas City, Texas. Since becoming an Owner/Operator, he has served on many different committees and boards in McDonald's while growing and leading his organization to be a leader in McDonald's. His wife, Mady Kades, was also very involved in the local communities and helped with the growth of their business through marketing. She worked with Shell, local schools and founded the Space Race which worked with Space Center Houston to bring a wonderful event to help support RMHC. Ken's company employs over 1,000 people and continues to work with the local schools, groups and city to bring the community together. Everybody at our company is dedicated to making your experience a great one. The restaurants within our organization are the best run in terms of service and proven customer satisfaction. We are here to make your every visit, an unforgettable one. We pride ourselves on equal opportunity employment, absolute community involvement, clean facilities, fast service and hot & fresh food. We are actively involved in all aspects of our local communities as well as national and international charities. We are well known for the Ronald McDonald House as well as World Children's Day. We completely support our local Ronald McDonald House Charities in Houston and Galveston. 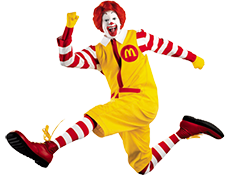 To know more about Ronald McDonald House Charities in the Houston area, go here RMHC in Houston . Each of our The Kades Corporation Restaurants makes a strong effort to be actively involved in the fund raising efforts, as we well as the support for each school in our communities. We are involved in local carnivals, parades and any city event that helps bring our communities together. We support and sponsor many local kids groups and sports teams to help promote a healthy lifestyle and helping keep kids active. We are committed to the community and have set up this site to make it easy for charitable organizations, churches, and schools to request many services that we offer our community. Below you can use the map to locate the restaurant that is closest to your organization to help with finding the correct restaurant team to work with.